Warning: This will be a long email, so if you want to just scroll downto the pictures first (we know you always do) we won't be offended. Hello from Paradise! We've finally made it to the beach, and we can safely say it was worthit all to get here. We left Cebu a week ago on "Weesam Ferry" toTagbilaran, Bohol, a smaller island. 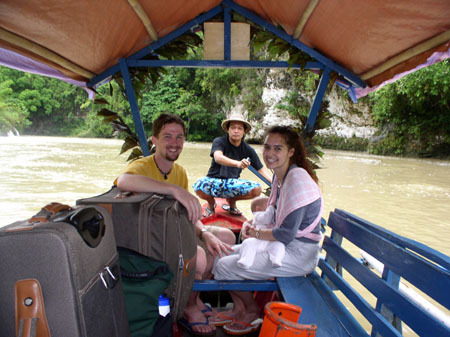 We arrived in Tagbilaran and tooka bus through jungle and pleasant little villages on our way to NutsHuts, a resort on the river that had been highly recommended to us byLonely Planet. The bus was supposed to drop us off at a boat dockwhere a pumpboat would take us up the "Mighty Loboc" river, butneither the bus driver nor the people we asked really knew where itwas, so we ended up being dropped off by the side of the road at thebeginning of a rough trail marked "750 meters to Nuts Huts." 750meters is not far, unless you are travelling with two large rollingsuitcases, a heavy backpack, and a baby (we had left the framebackpacks we originally brought in Manila because we thought rollingsuitcases would be easier to travel with. Yes, the joke's on us). Bythe time we had bumped and dragged ourselves and our luggage to thetop of a steep winding staircase down to Nuts Huts, the larger of ourtwo suitcases had been completely destroyed and the smaller one wasnot far behind. The Belgian hippy proprietor of Nuts Huts welcomed uscordially, and commented placidly that he had never seen people try toroll in luggage before. 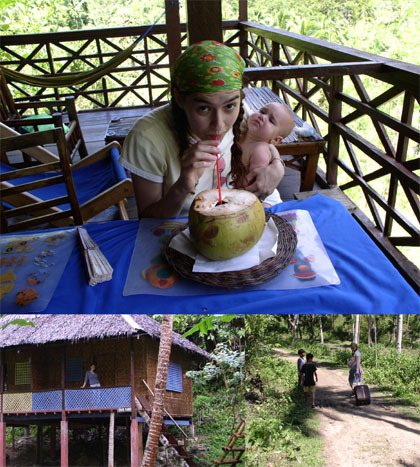 We dragged our bags down the rest of the stepsand settled into our picturesque nipa hut on the river. As we driftedoff to sleep, the jungle awoke around us, and we could hear anorchestra of insects and other inhabitants serenading us through thetrees. When we woke the following morning we had experienced enoughauthentic living with mosquitos and spiders, so we decided to relaxand then leave the next day. That night it rained all night andcontinued in the morning, so we slogged up a hundred slippery stairsto the charming outdoor restaurant and watched the tropical rains comedown around us from hammocks on the porch. Axa loved swinging back andforth in a hammock, and she even fell asleep long enough for mommy anddaddy to have a nice dinner without the customary juggling actrequired to keep her from grabbing anything within her nowconsiderable reach. By midday the rain had slowed down enough to make leaving possible.This time we took the pumpboat, first up the river to the falls, andthen down to a spring that created a delicious natural swimming hole.The river was high and chocolatey from the recent rains, but where thespring came up off to the side, it turned turquoise blue andbrilliantly translucent. We could not resist the opportunity for aswim, so we changed in the boat, and Axa played with the boatman whilewe jumped in and frolicked in the water, with a light drizzle stillpattering around us. We left the boat and entered a jeepney crammed with people along bothfacing benches to go back to Bohol's capital city of Tagbilaran. Justwhen we thought the jeepney had reached its extreme limit of capacity,the driver produced several stools which the unfortunate passengerswho entered last were required to balance between their legs as theyswayed back and forth between full benches of people. From Tagbilaran,we took a long, hot, slow, noisy, bumpy ride on a motorcycle sidecarto Panglao Island, which is connected to the main island of Bohol by aland bridge. 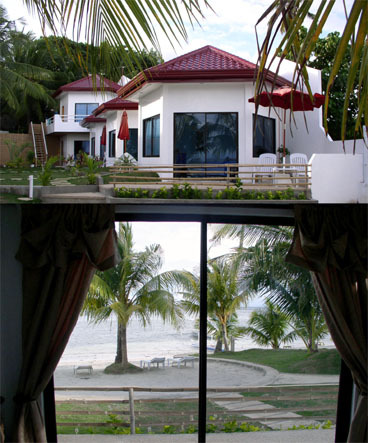 We arrived at Alona Beach in the midafternoon, and thesun came out over the white sand and the sparkling ocean. 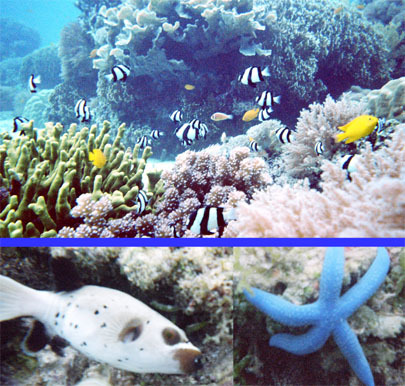 We were led by one of the insistently helpful locals to a resortcalled "Charlotte's Divers," where Tony negotiated such a good pricethat the staff decided they needed to confirm it with the absentmanager. They sent him a text message and told us it was fine, so wemoved in with our bags (which yes, we had dragged over several metersof sand to get there) and went to get some lunch at a beachsiderestaurant. However, a few minutes later, the person who had shown usthe resort came up and sheepishly told us that the manager had arrivedand was very upset. We went back to the resort to find him, hands onhips, lecturing the staff and taking their tips. He was a very irateKorean who spoke almost no English and seemed to be angry at the wholeworld, but especially at us and his staff. He looked ready to throw usall out, and insisted that there would be no discount. His interpreterand the two hotel staff were standing around looking mortallyembarrassed (this was all an extreme breach of normal Filipinoetiquette, which always treads on eggshells around anything that couldin any conceivable way embarrass anyone). We were more amused thananything at the way he was carrying on. With a littlejudicious diplomacy on Tony's part, he eventually calmed down andagreed to let us stay there at something between the normal rate andTony's discount. Still, we elected to find another place, reasoning that atleast we wouldn't lie awake at night wondering if our volatile hostwould come pounding on our door in the middle of the night and demandthat we leave or pay exorbitant fees. We were glad we left, because we were cordially welcomed at IsisBungalows, where we settled in to a lovely bright hexagon with threesides of big sliding glass windows facing the beach. Thus it was, thatwhen Grandma Familia called as Tony and Axa were playing in the sandon the beach and Sarah was swimming in the crystal clear water, andasked if we could possibly come home early (yes, that's the phone callpictured below), she was doomed to disappointment. 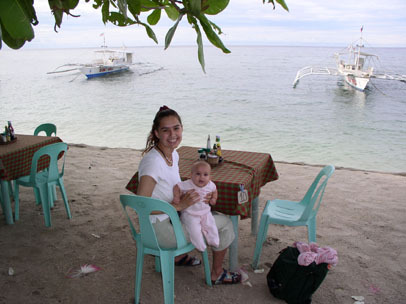 Most of our timeon Alona (our beach on Panglao Island) was consumed in romantic walksalong the beach, swimming, and eating at our favorite beachsiderestaurant, Trudy's Place. We liked it because of the excellent food,reasonable prices, and waitresses who didn't mind at all when our babyfussed, and in fact entertained her whenever she seemed less thancontent. While staying on Alona Beach, we traveled inland to see a healthclinic sponsored by "Vaccines for the Philippines," a foundationorganized by some BYU and U of U students who raised $30,000 sellingrubberband bracelets at U of U games to buy medicine for the people ofBohol and then came over with their families and friends to distributeit. We'd met them when we went to church in Tagbilaran. We expected tobe the only Americans there, and instead were surprised to find thathalf the congregation that week turned out to be Caucasian and fromUtah. On Friday we decided to take the "Choco Tour" of Bohol, so namedbecause it ends in the island of Bohol's most famous attraction: theChocolate Hills. We hired a gregarious driver named Jojo and set offin a car with windows tinted like a limo all the way round, even thewindshield. 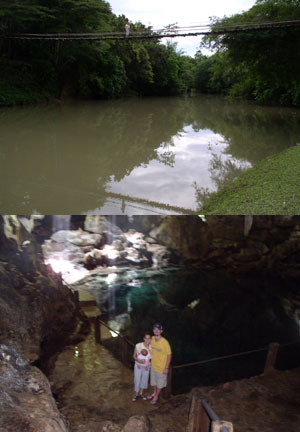 The first stop on the tour was the Hinagdanon Cave, aspooky, somewhat brackish pool housed by a cavern filled with swallowsnests and bats. Sunbeams let in through multiple outlets to the skylend the cave a mystic quality and help to illuminate the dramaticstalactites dripping from the ceiling. 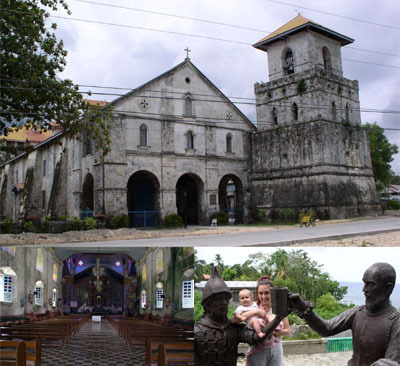 The historical portion of the tour covered the "Sandugo," which marksthe place where Miguel Lopez de Legazpi (Spanish conquistadorextraordinaire) and Rajah Sikatuna (chieftan of Bohol) reputedly eachdrank a cup of each other's blood to cement an early Hispano-Filipinopeace accord. Whether it was a barbaric native practice or a barbaricSpanish practice we're not sure. Next we visited the massive stonechurch in Baclayon, built in 1596 and covered all over in fine greenlichen. There is a museum attached, full of amazingly well-preservedgarb worn by the priests, massive old latin hymnals, and assortedreligious relics, buried in millimeters of dust. We're not sending anypictures because we weren't allowed to take them. The road we were taking then left the coast and dived into the lushinterior of Bohol. Along the Loboc River we reached the site we weremost looking forward to seeing: Bohol's tiny mascot, the tarsier.Although the tarsier is the world's smallest primate, he is probablynot among the more intelligent, since each of his eyes is larger thanhis entire brain. Intellectual prowess aside, words are inadequate todescribe the sheer cuteness of the tarsier. However, his cuteness tointelligence ratio may have something to do with his status as anendangered species. 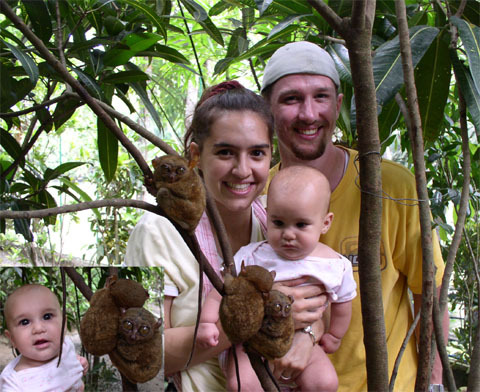 Needless to say, the tarsier's meeting with ourown little tarsier involved a lot of staring on both sides. When we had stared our fill at the tarsiers (not knowing if Axa wasdone), we continued on our way, pausing to cross the IndianaJonesesque hanging bridge to the accompaniment of a typical sappyFilipino rendering of "Yesterday" by a young guitarist. An almostsurreal twist in the road led us into the man-made forest, a largeplanting of mahogany trees that for a few hundred meters turns thetropical jungle into a copy of the California coastal forest. As wecontinued inland, we came upon rice fields just at planting time. Theplanters were happy to show us their work. The rice is first seeded ina small area. When it has filled that area with a beautiful lush greenit is pulled up and separated into clumps. Each clump is thenpainstakingly replanted far enough apart to allow the rice to grow.The result is an entire rich field of rice from just a few seeds. 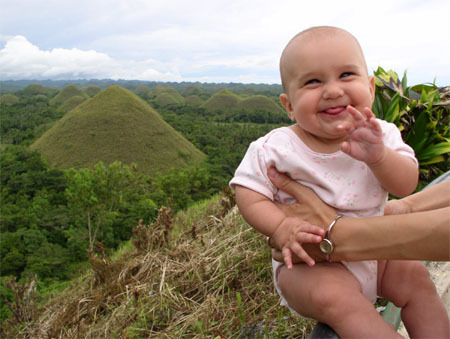 We were nearly to the Chocolate Hills. Jojo explained to us how theyhad been formed. Two giants loved the same woman (we can only assumeshe was also a giantess). They fought a fantastic battle all overBohol, until one was finally vanquished. 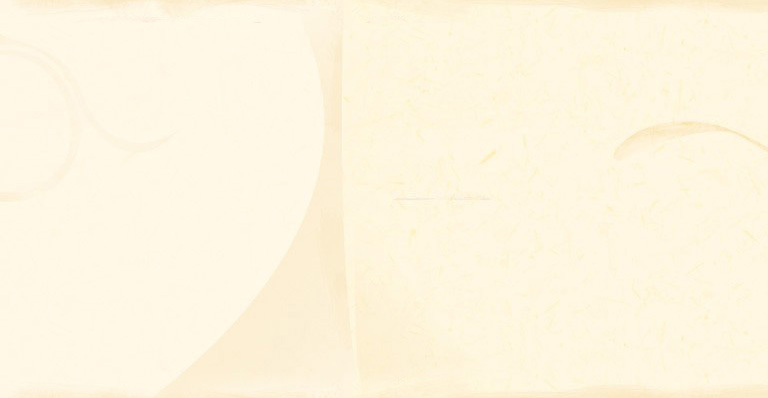 The winner went off with thegirl, and the loser's tears fell on the ground and calcified into thestartlingly shaped hills. We are told that in summertime the foliageon them dies, making them look like huge chocolate kisses. They werestill green when we arrived. We had planned to reach them just beforesunset, when our guidebook had assured us they would be at theirprettiest, but we arrived a good two or three hours early. We climbedto the lookout point, took some pictures, and sat down to wait it out.We eventually decided it wasn't worth the wait, so the picture you seeis not of the chocolate hills at sunset. You will notice that Axa isvery pleased. She is gleefully demonstrating with her fingers how muchtime is left until sunset. Saturday we got up at 5:30 to go out dolphin watching and islandhopping. We went out in a little boat and we watched and watched, butno dolphins were forthcoming. We did, however, visit the island ofBalicasag, where we went snorkeling and took pictures with ourdisposable underwater camera. 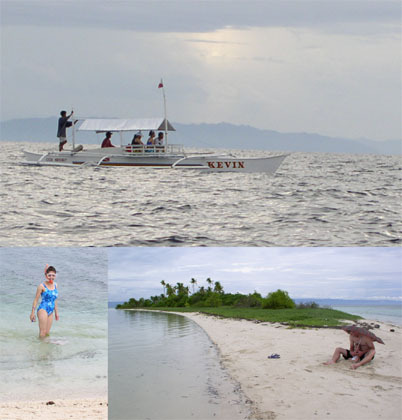 We also landed on Virgin Island, aftercircling the whole island in our boat. It is mostly beach, andinhabited only by ghost crabs and a few coconut palms. When we boardedthe boat to return to Panglao, the engine made only ominous sputteringsounds when the boatman tried to start it. After several tries, hesaid, "sira" which Tony translated to me as "broken." Starklyconfronted by the hopelessly cliche-ish probability of being strandedon a desert island, we looked at each other and shrugged. But theboatman gave one last mighty pull, and the engine roared to life, soour trip concluded relatively uneventfully. We slept on Alona Beach for the last time last night, and we're nowback in Cebu City, before we head for Malapascua Island tomorrowmorning. We hope you are all doing well and enjoying your summer.We'll see you in a month or so!